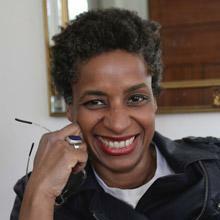 Yvonne Latty is the Director of the Reporting New York and Reporting the Nation programs at the Institute. She has produced documentaries, hosted, produced and edited podcasts and worked as an urban newspaper reporter. Latty is the author of In Conflict: Iraq War Veterans Speak Out on Duty, Loss and the Fight to Stay Alive and the critically acclaimed We Were There: Voices of African American Veterans, from World War II to the War in Iraq. In Conflict was turned into a theater piece that premiered at Temple University in October 2007, received rave reviews at the Edinburgh Fringe Festival and was awarded The Fringe First Award. In Conflict played Off-Broadway at the Barrow Street Theater. In Conflict was also at the heart of a Wilton, Conn. high school play that after being banned by the school principal, became an international story and was then performed in several Off- Broadway theaters, including The Public Theater. Both plays were published by Playscripts. Latty is a Dart Fellow for Journalism and Trauma and a Leeway Foundation Fellow. She is a lifetime member of the National Association of Hispanic Journalists and a member of the National Association of Black Journalists. Her work has appeared in USA Today, Chicago Sun Times, BET.com, The Washington Post, The Huffington Post, and numerous other media outlets. She has been featured in over 100 media outlets including, Newsweek, CNN, The New York Times, CNN International, Fox News, NPR, The Philadelphia Inquirer and Detroit Free Press.